Derbyshire has signed New Zealand international batsman Henry Nicholls for the final two Vitality Blast group matches. The powerful middle-order batsman will replace Pakistan fast bowler Wahab Riaz as overseas player for the last two group games this summer and any potential quarter-final fixture, should the Falcons qualify. 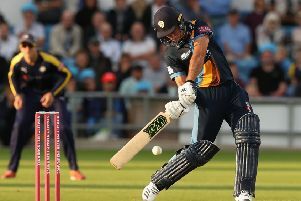 Twenty20 captain, Gary Wilson said: “With qualification potentially going down to the final game, it was important that we secured an overseas replacement for Wahab. “While Henry is not a like-for-like, he provides us with a powerful batting option and international experience. This could be key as we try and close out some high-pressure games. Nicholls added: “It’s an important week for the club as they attempt to lock-down a quarter-final place. In the Test series against England in March, he top scored with an unbeaten 145 – his second Test hundred – as New Zealand claimed an innings victory at Christchurch. In total, he has featured in 38 Twenty20 fixtures, scoring 875 runs with a strike rate of 126 and a top-score of 67 not out. He also has experience in the Big Bash League representing Sydney Thunder in 2016.